This luxury conference folder is crafted from the finest British calfskin leather and complemented with a rich silk lining. 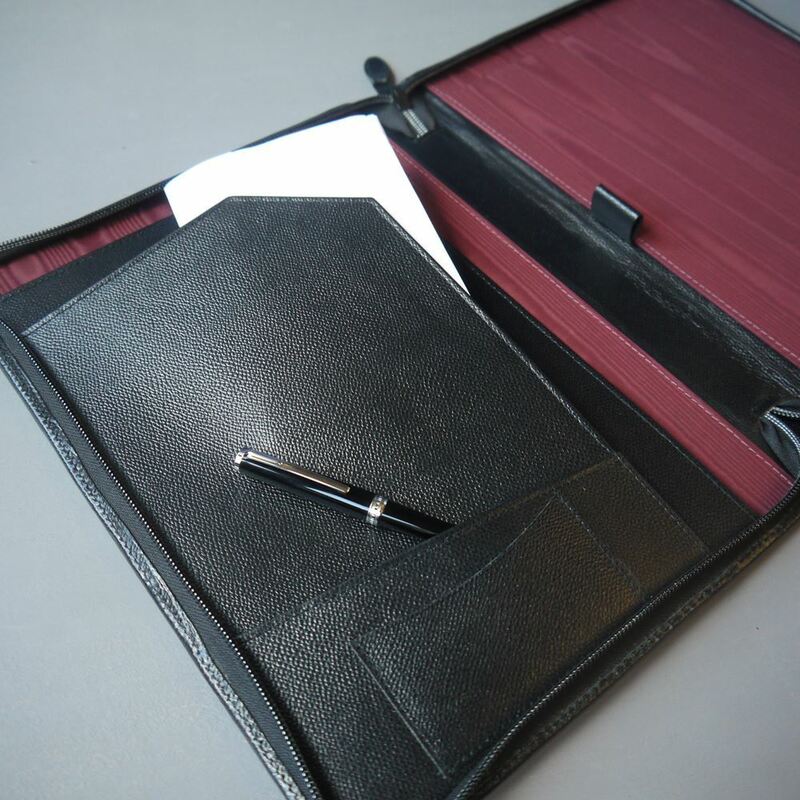 With areas for documents, business cards and a pen the folder is secured with a luxury, leather tagged zip. Comes complete with a complimentary notepad and the colour can be customised to suit corporate branding. The ideal gift for ladies or men, 18th or 21st presents, birthdays or anniversaries, the pen will take standard ink cartridges. Also available in the Moorgate collection is a pencil, ballpoint and rollerball. This luxury luggage label makes the perfect addition to any suitcase, hand luggage or briefcase. Crafted from the finest British calf leather this stunning tag will keep your belongings safe and assist in spotting your bag at the airport. Available in black, mulberry and red as standard, please select your colour when ordering. Add a personal touch with our embossing service. This luxury travel backgammon board is crafted from the finest Mulberry British calf skin leather and finished with rich inlays of black and cream. Each checker is hand-encased in leather and comes enclosed in a clever, zipped compartment at the end of the board. These items are bespoke by our master craftsmen and as such, the coloured leather can be customised to suit your personal taste where possible. Dimensions: Length 38.5cm x W 29cm (open). These striking 7cm diameter globes are made in blue glass with the countries etched and inlayed with silver or gold. They stand on a flat base but can also be can fitted to an aluminium base which can be engraved with your details.